I take pride in always knowing where my keys are. In my 29+ years on earth I have very seldom misplaced them. I am often looking for keys, but usually not mine. I look for papers, keys and other things for the handsome man who lives in this house. My father had a large bucket with keys. You read it correctly--a large bucket. My mother was always helping him look for both keys and glasses. or some reason they were often somewhere else. So I made a Facebook event, invited our children with spouses, and also the love of my life. The invitation was called "Looking for Heidi's cabin keys", in addition to an explanation that read, "I often loan you my keys and cannot find my cabin keys. It is a blue plaid key with a knitted purple owl key ring. Can anyone remember seeing it? I would be so happy to have it back (the date is random--just needed a time for the event)." I sat back and waited. Surely one of our kids would step forward, apologetically explaining why my key had been in their possession for months and why they had forgotten all about it. No one answered. Not a pip on the event page. Until last weekend. We went to the cabin. I brought one of my spare keys. After a wonderful hike in the mountains, fall colors everywhere, a beautiful blue sky above, hot chocolate on thermoses, we returned to the cabin and I emptied out my pockets--and there was my long, lost key. Embarrassed I wrote the following on the event page, "Found them at the cabin!! Thank you to everyone who turned their house upside down and spent the whole weekend searching for my keys . . . ha ha ha." I don't expect any of our prescious children even thought about my keys, but embarrassed or not, I am thrilled to have them back. that even I can misplace keys--and other things. 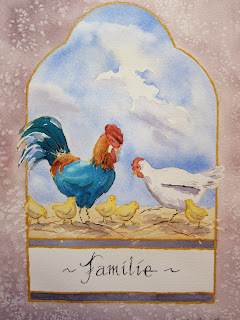 Today's water color is called "Family".